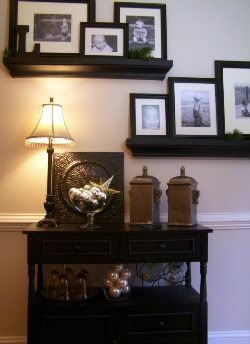 There is more to see in our entry way, but that will be another post. I love having painted green walls, especially for Christmas! It made decorating very easy since a majority of the color was already there. 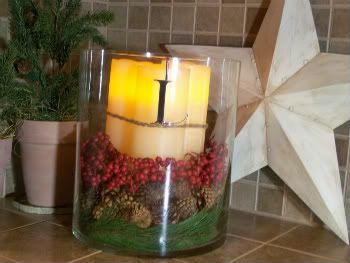 I added a few touched of red and green but kept most of the other decor simple and neutral. I was inspired by nature this season! The two tiered iron St Germaine stand is from Ballard. 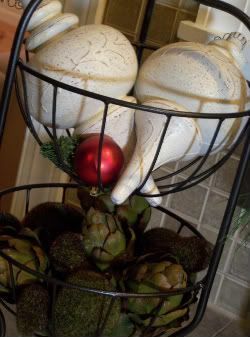 The fresh fruit it normally holds was replaced with a couple oversized ornaments and the bottom was filled with faux moss rocks and artichokes. 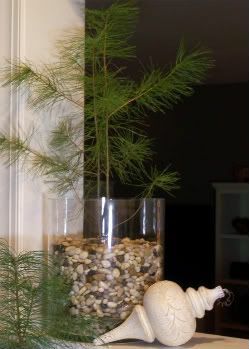 I brought in a few baby pines from our property; you can see this project here. It has been a few weeks now and these little guys are doing great indoors! 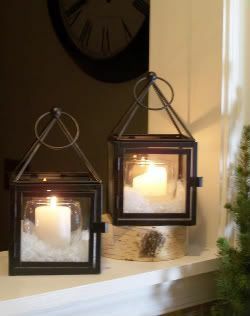 I just adore lanterns ~ I can not pass them up any time I see them. This little pair is from TJMaxx. Another live pine sits next to my moss terrarium; You can find more info here. Nestled behind is a faux potted seedling I put together here. More potted seedlings sit beside this large glass hurricane I put together layered with some simple fillers; more info here. 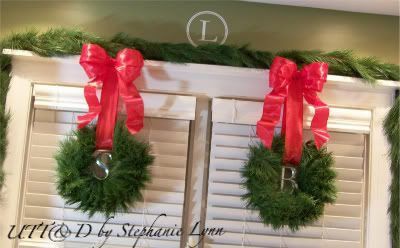 The window is dressed with some braided pine garland and wreaths. I love the combination of the deep green and red satin ~ it puts me right in the spirit! The initials inside the wreaths are ornaments from Restoration Hardware. This hurricane is filled with some red ornaments on top of reindeer moss to carry the red and green to the other side of the counter. 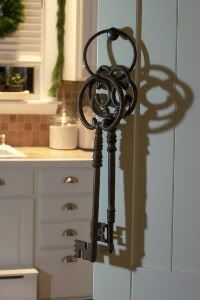 Some magical oversized keys hang from the secretary desk door just for Santa! Atop the secretary sits my charming muslin and burlap rag balls; easy directions here. Ignore my printer and huge compass…. I really wanted this room to sparkle with a little glitz and glam. Since our furniture pieces are all dark black/brown I used a combination of gold, silver, platinum and champagne hues to dress it up. 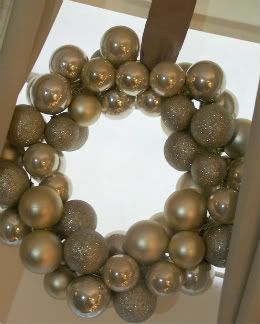 This fabulous garland came from Michaels…I think I will be finding glitter from this thing for the next entire year and then some. 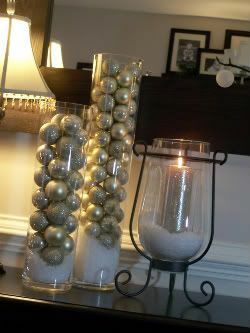 A few painted black branches make up my ‘holiday arrangement’ ~ So much easier and more cost effective than flowers for a change! …so pretty when the light catches them. A little winter birdie cloche sits quietly underneath; more on the Birdie Cloche can be found here. I love large glass pieces such as these cylinder vases. They have so many uses! 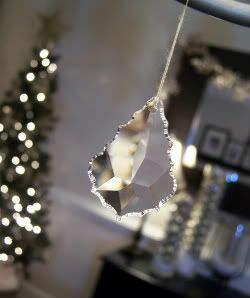 I filled these with a layer of *snow* and a mixture of ball ornaments. Some shiny, some matte, and some glitter! The candle hurricane holds my ‘made-over’ sparkly glitter candle (directions here) and some more snow…a couple bags of this stuff goes a long way! The tree in this room is not very big but fills the corner space perfectly. 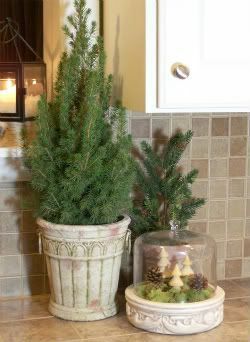 To add some height I placed some sturdy boxes inside a galvanized tub and sat the tree on top adding a layer of sheer organza to cover the base. I found all the ornaments for this tree at the $Tree. The color of them caught my eye and inspired the coordination of this room. Too good of a deal to pass up! Of course I had to create an Eddie Ross ‘staple’ Holiday wreath. These are so pretty and Eddie is fab.u.lous! 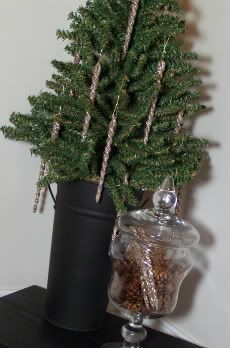 A tall metal bucket holds this tabletop tree decorated with champagne glittered icicles. 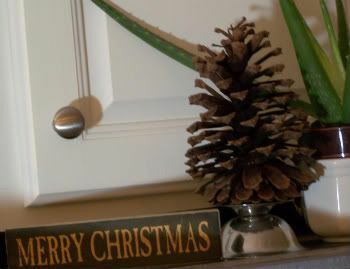 Nestled in the apothecary jar is some pinecones and more glittered icicles. If you remember during thanksgiving I need something for this wall…well I repurposed a kitchen island as a mini bar with a couple coats of black spray paint. It works well for now and fills the space. More glass ornaments along with a $Store star and greens. 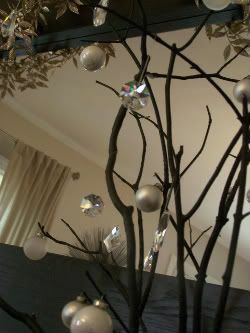 I perked up the star with a mixed coat of silver and gold spray paint. Two more lanterns filled with (you guessed it) more *snow* and painted snowflakes dress up this corner. 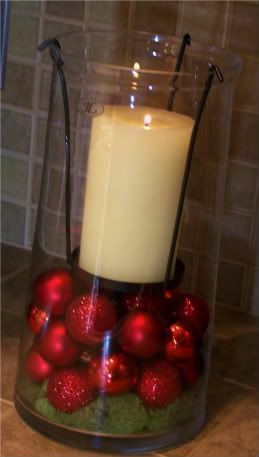 For added height they are sitting on top of chunky candle holders. I gathered my collection of mercury glass finials to display on top of the pantry cabinet. I *love* the look of these grouped together. 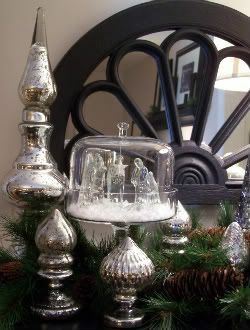 The cloche stand holds a miniature glass nativity set. 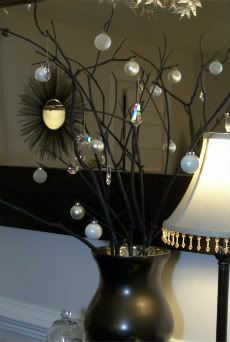 I finally found a home for my Faux Mercury Glass Trees! If you missed my tutorial you can find it here. 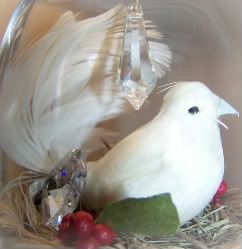 Finally, I added some more Swarovski baroque shaped crystals to the chandelier. The shape of these is fabulous! Yep, I’ll be cleaning the drool from my keyboard over this post for some time. 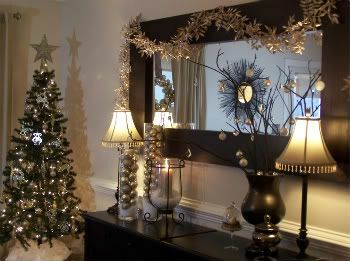 I adore everything you’ve done to christmas-fy your home! 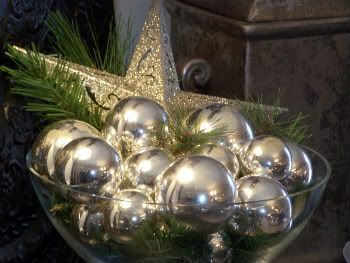 Faves: mercury glass! 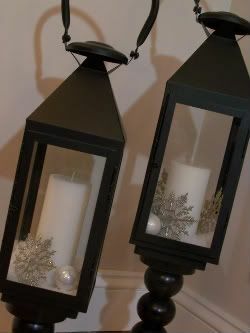 lanterns! cloches! natural greens and sticks and pinecones! Wow. Really gorgeous. So many awesome ideas to try (next year), and thanks for the tutorials too. 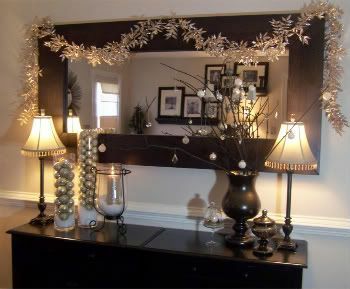 Makes me want to start all over with my holiday decor. Wow, I am loving your decor! 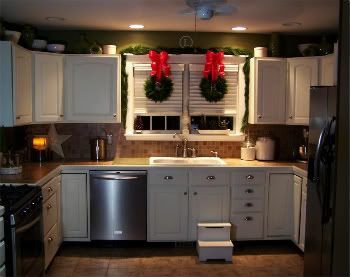 I love the kitchen and the wreaths! What a great idea with the initals! I also love the greenery you took from outside and put in a vase! 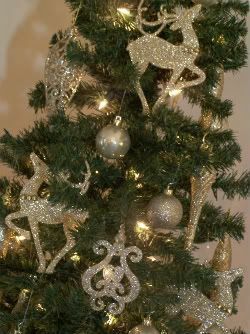 Oh and I really love that bling tree! How awesome is that!! 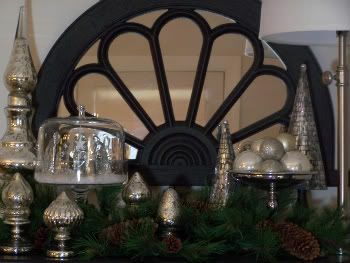 LOVE your house…especially love those wreaths in the kitchen! Wow! HOw stunning! Right out of the pages of a magazine! Everything is sooooo gorgeous ! Your dining room is especially fabulous with all the silver glittery goodness ! Beautiful simply beautiful, I can tell just by looking at your home that you are gifted with your hands, thank you for sharing. It’s all gorgeous!! Love it! I am not kidding when I say that I would buy everything in your home. Fabulous, fabulous, fabulous! Gorgeous! I love the look of living room. 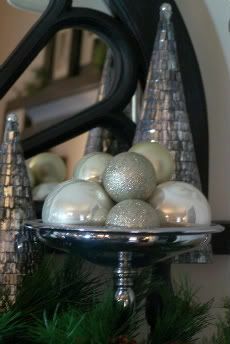 If I wasn’t so sentimentally attached to all my old Christmas decorations, I would start over and do my house in metal tones like that! Your house is gorgeous! 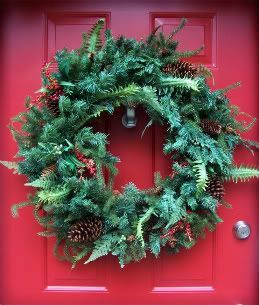 Love all your decorations…that wreath is so pretty up against that red door! Your house is stunning, all of the fresh greenery, trees, hurricanes and lanterns oh-my! Loving it all, thanks so much for sharing. Your house is absolutely beautiful. I love the colors, I love the simplicity and the elegance. Merry Christmas! I love your nature-inspired theme. Everything looks very elegant and really lovely. Thanks for opening your home for the tour. How stunning and elegant. My favorite is all the natural pieces. Everything looks so festive! Your home is lovely! yahw-zah! that’s a lot of goodies to look at. those over-sized jingle bells are too fun…everything is FAB. 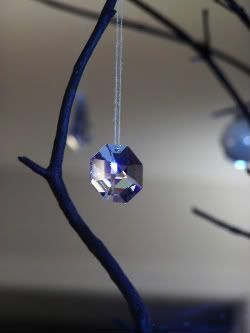 Just beautiful… simple and elegant! There are so many wonderful things that I Love in your home. I think both posts are just amazing. All those pretty items turn a conventional room into a wonderful place full of magic! The dinning room is gorgeous!